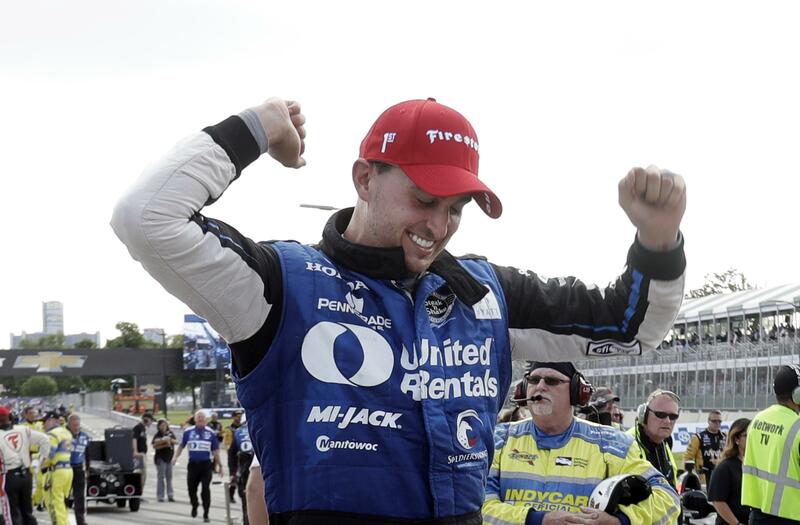 DETROIT – Graham Rahal had such a comfortable cushion while cruising toward victory at the Detroit Grand Prix he toyed with his push-to-pass system. “I pressed it a couple times just for kicks,” he said with a grin. He certainly didn’t need it. Rahal won the first of two Detroit Grand Prix races easily, finishing six-plus seconds ahead of Scott Dixon on Saturday. The Rahal Letterman Lanigan Racing driver declared the day before he could dominate the field if he started up front. And, Rahal was right. He won the pole earlier in the day with his Honda-powered car and led a career-high 55 laps of the 70-lap race. There hasn’t been a repeat winner in the first seven races of the season. Hinchcliffe was third for Schmidt Peterson Motorsports, giving Honda the top three places in the race in the shadows of General Motors’ world headquarters. Josef Newgarden, driving for Team Penske, was fourth in the only car with a Chevy engine among the top seven in the 22-car field. Indianapolis 500 winner Takuma Sato was eighth with his Honda-powered car for Andretti Autosport. Dixon moved into the points lead, quite a feat less than a week after getting knocked out of the Indianapolis 500 in a terrifying crash in which his car sailed through the air and landed cockpit-first atop the inside safety fence. Dixon’s car broken up into pieces amid sparks and flames. After his news conference in Detroit, he walked with a limp and kept weight off his sore left foot as he went down stairs. “All things considered, everybody’s pretty happy,” Dixon said. Rahal’s wife, drag racer Courtney Force, had her car engulfed in flames Friday night. Helio Castroneves trailed only Rahal with 11 laps led, but finished seventh to extend his winless streak to 51 races since winning his third Detroit Grand Prix in 2014. Hinchcliffe spun out on the opening lap and was fortunate his fellow drivers avoided hitting him, leaving his car unscathed. He was one of five drivers to lead at least one lap and had his best finish since winning at Long Beach in April. “I’ve been around the series long enough to know turn one doesn’t have to run your day,” he said. IndyCar completes its only doubleheader of the season, racing again at Detroit on Sunday. Following that race, the series will shift to Texas Motor Speedway for a race under the lights on June 10. Published: June 3, 2017, 2:40 p.m. Updated: June 3, 2017, 5:44 p.m.